Dr. Kim Lauenroth is Chief Requirements Engineer and leads a competence center for requirements engineering at adesso AG. He has over 10 years of experience in software and requirements engineering in different domains. He regulary speak at internal conferences in the topic of RE. Within IREB, he is involved in the development of the advanced level modul Elicitation & Consolidation. 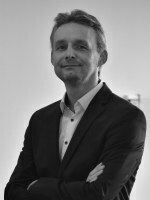 Kim Lauenroth received his PhD in the field of requirements engineering from the Universtity of Duisburg-Essen and studied computer science, business administration and psychology at the University of Dortmund.